I love this picture, I took it my first day in Rome, the first day of my first vacation in Italy. It's the gate to the garden belonging to a monastery, right in the heart of Rome. I see this image every time I upload new pictures and I always have to pause and look at it for a moment, it takes me right back to Italy. And here is my tribute to that beautiful image, made with knitted wire and beads. 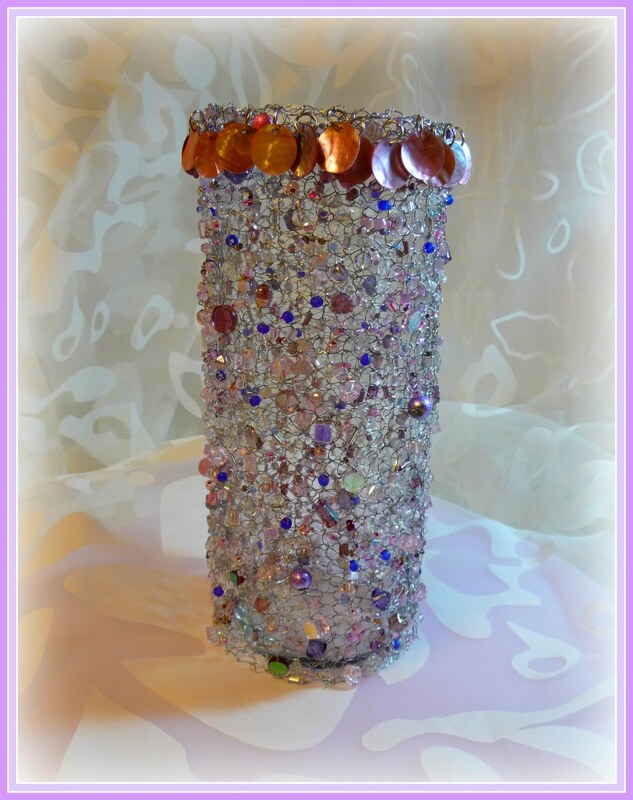 I made my wire fabric especially to fit this glass vase, and added a wreath of pink mother of pearl discs around the top. 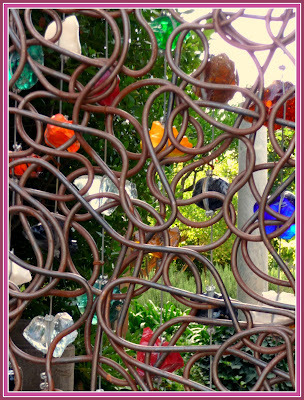 The beaded wire fabric really draws your eye, lots of sparkly beads to look at. 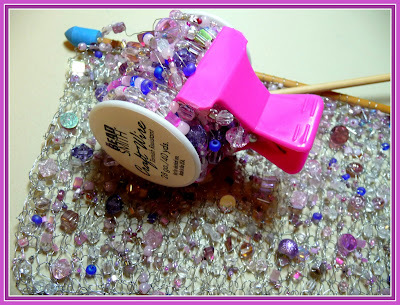 I didn't scrimp on the beads as you can see! 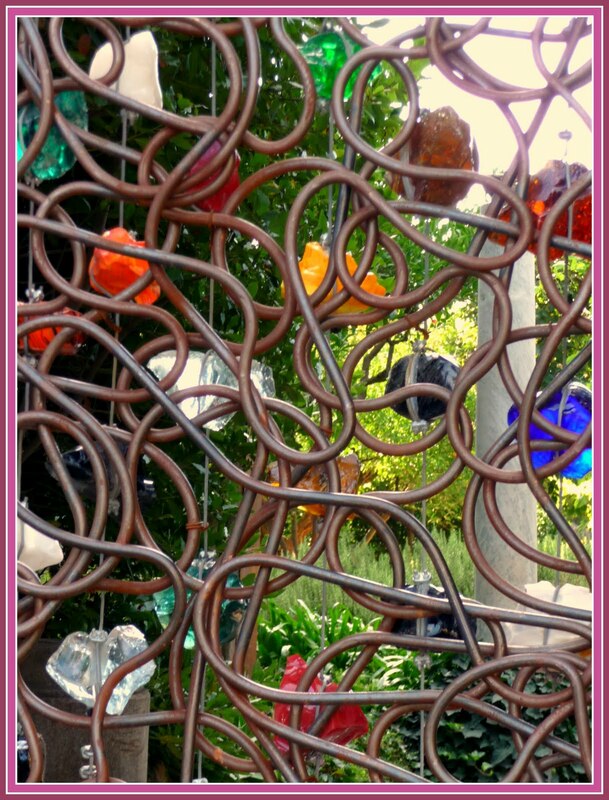 If you want to create something similar for yourself, I can give you some details that will help you estimate the materials you will need. This vase is 8" tall with a 10" circumference, so I needed to make a knitted wire panel 8"wide by 10" long. I took those measurements and used them to figure out the square inches, this helped estimate how many beads/wire I would need. So 8x10=80sq inches. 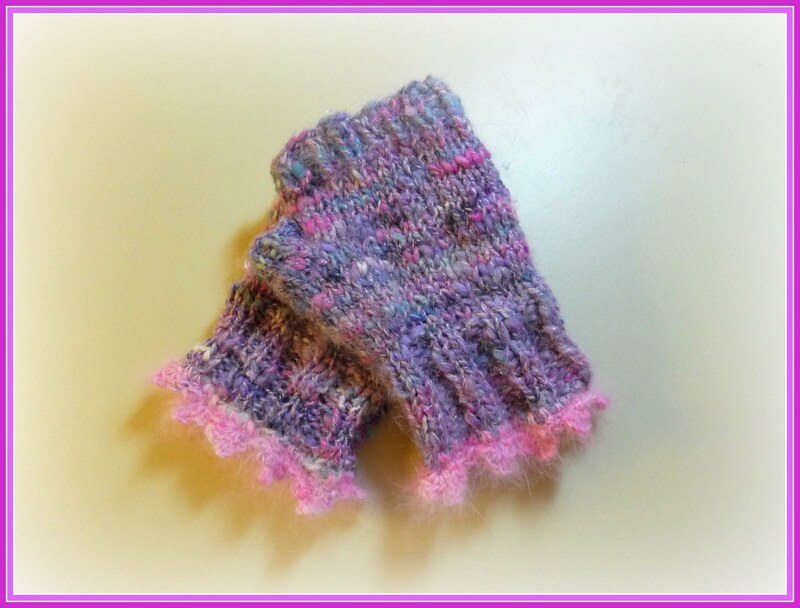 I knew from my test swatch that I liked how it looked when I used approximately 15 beads per square inch. 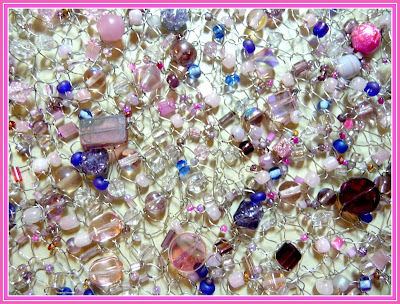 Let me just stop and talk about beads here for a moment, I used a variety of sizes from seed beads on up to around 10 mm. I chose a color palette of pinks, purples and blues and some beautiful Swarovski lead crystal, clear beads for extra sparkle. 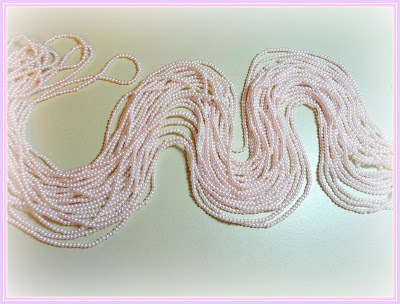 When I was stringing them, I counted groupings of smaller beads like the seed beads as one bead, so 3 seed beads = 1 regular bead. For this project I used nearly two 40 yard spools of 28 ga wire, I had probably 10 yards left over, but for something like this it's better to have too much than too little. 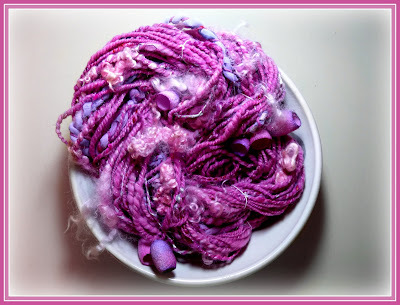 So lets just use a nice round figure, two spools equal to 80 yards total divided by the 80 square inches of fabric created, means that for every knitted square inch, you will need approximately 1 yard of wire. 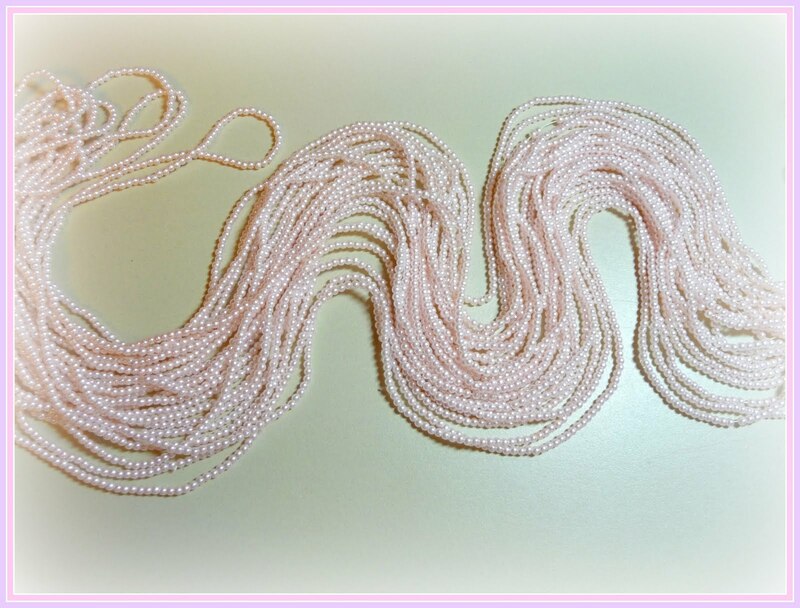 Calculating the number of beads, as I said I used 15 per square inch, so 80 sq inches x 15 = 1200 beads. 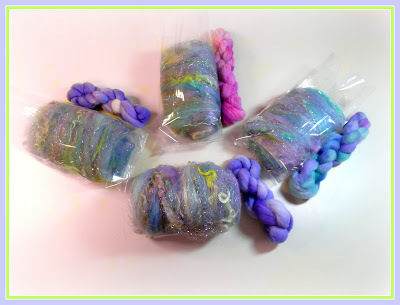 I strung half on each spool and wound it back around the spool to keep things tidy and organized, plus I used some iridescent beads and I wanted to protect that surface from getting scratched and banged around. So now, the last important detail, how many stitches to cast on? I used size 7 bamboo and for every inch of wire fabric I wanted to create, I cast on 5 stitches, so for my 10" circumference vase I cast on 50 stitches. Your gauge may be different, with something like this, it couldn't hurt to do a test swatch. When it was done, I sewed the butted up ends together with wire, and slipped it over the vase. I like that it comes off so that I can wash and dust the vase if I need to. 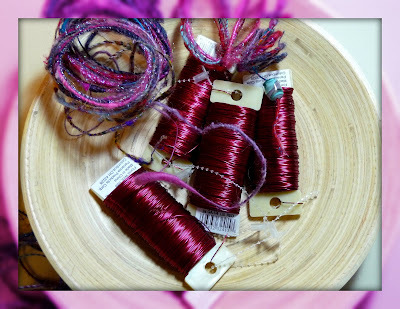 Hey artsy spinners, I found paddles of this pretty burgundy 24 ga wire, perfect for wire core spinning, in with the discontinued Christmas items. It was only .19 cents!!! I originally picked up two, then went back for more last night...good thing, there were only two left!!! (Kentwood store) Check your local craft store maybe there is hidden treasure mixed in with all the glittery poinsettias! It's gonna be wonderful for wire core spinning, if a little shiny wire peeks through, it will look pretty. 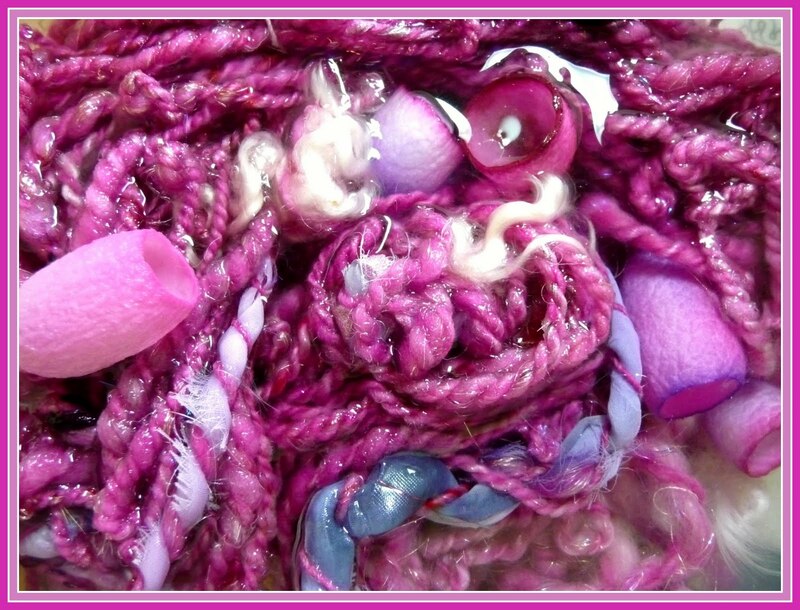 I've been totally immersed in all kinds of very satisfying fiber doings this week. I got an order for a custom spin, which was a real treat so I got to have some fiber play time, I really enjoyed myself! And by tomorrow this artsy skein will be dry enough to ship off to her new home. 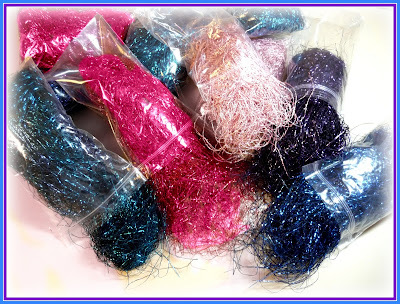 I ended up with 91 yards of chock full of pink lamb locks, metallic threads and ribbons, hand dyed silk cocoons, chiffon ribbons, and of course, sparkle in a beautiful palette of pinks! It was totally my kind of spin. 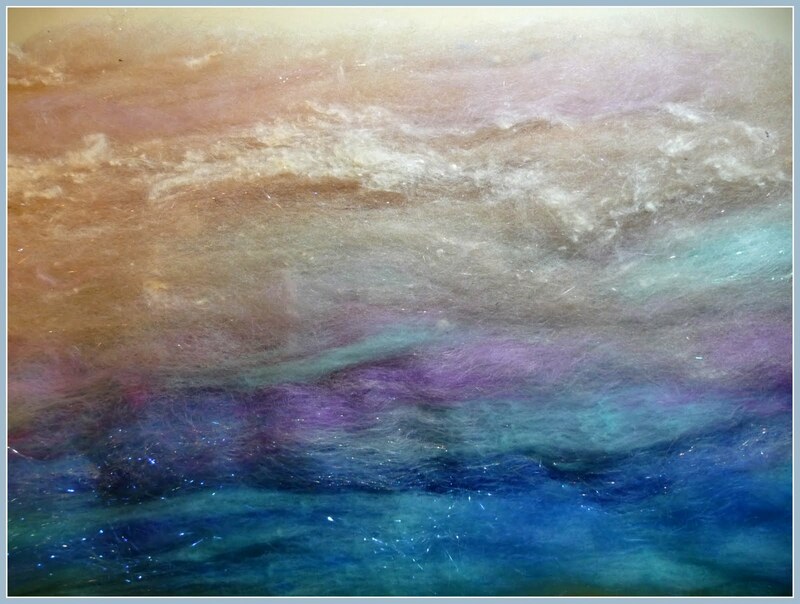 All dry now, or nearly so, I'm pleased with how this spun up and the recipient is too, and that's the big thing. Another noteworthy fiber happening is this Lake Michigan In The Summer, spinning/felting batt, which is a collaboration between my shop and the shop of my good friend Via Verde Farm. We each have one listed in our shop, I really want to spin one of these, so I'm going to have to do up another for myself. 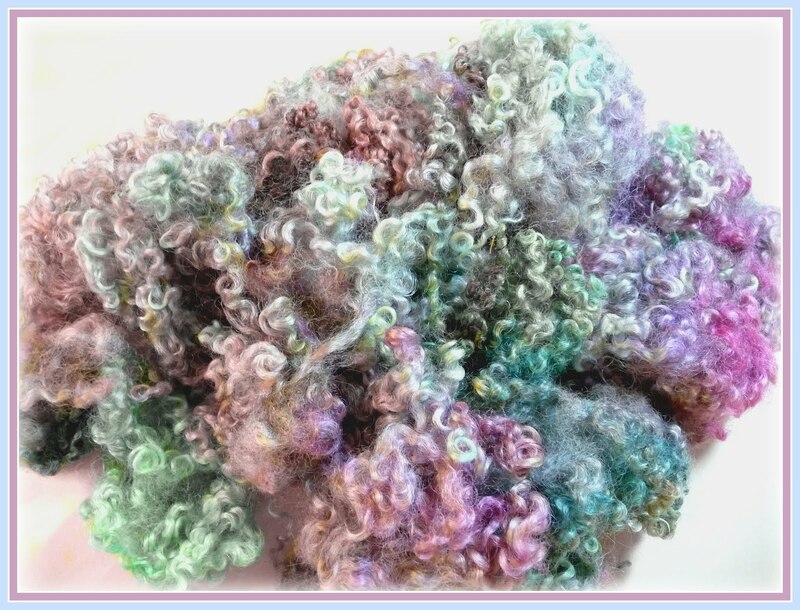 The fiber is a gorgeous blend of alpaca and silk from Via Verde Farm and my hand dyed wool, mohair and silk noil. I'm hoping to get in a little more spin time in the coming weeks, I've been away from it for a bit and I've really missed it, so that's one of my goals, the other is that I have set Thursday as my day to update the shop, so look for new fibery goodness every Thursday, with small updates here and there in between. Which reminds me, somebody talked me into the twitter thing...and I'll be trying my hand at that to see how it goes. If you would like to follow me (please) you can find me at TwirlyCurlyBird. Have a wonderful, fiber-tastic weekend! Blessings Friends! It's been an eventful week, chock full of good friends and fiber adventures, and I've experienced so many generous moments, thanks everyone! 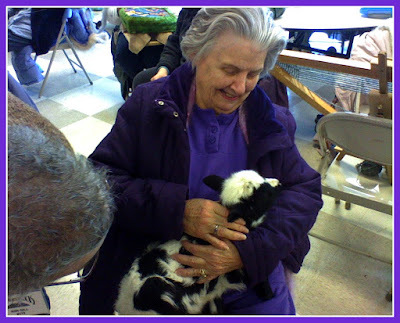 I brought my Mum along with me to my Spinners Flock meeting, we both really enjoyed it. She was thrilled to cuddle a darling little jacob lamb named Bella. My Mum is always happiest when cuddling babies...this little one is no exception. You can just tell she's smitten! Me too, such a little cutie! Thanks Bella! 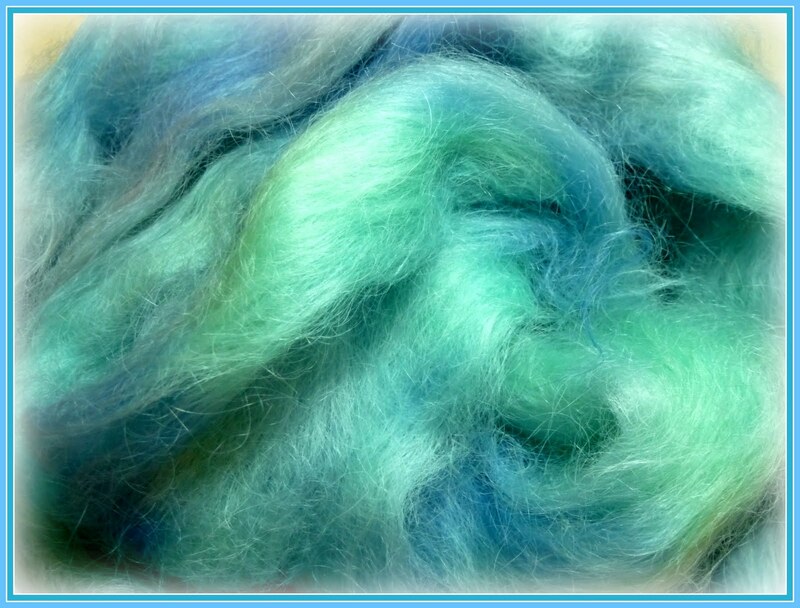 After the meeting, my friend Jan gifted me with generous heaps of fiber, including this mohair roving from her own goats. As you can see, I've been at the dye pots this week, I could not resist dying up some of the white mohair in my Big Blue Sky color Palette. Boy, I can hardly wait to get spinning! Thanks Jan! I did not realize until Sunday morning, that I had received another bunch of fibery wonderfulness in the mail on Saturday. After we got home from our big trip to Spinners Flock (2.5 hour trip ,one way) Mum and I settled in for the evening, and I completely forgot to check the mail. I was thrilled on Sunday when I found this absolutely delicious, chubby parcel, chuck full of bling! My new friend Moe had gifted me with the remainder of her Pizzazz stash from when she had a shop! Oh Boy, the picture doesn't come close to doing it justice!!! Thanks Moe! I am surrounded by wonderful friends who are generous in every way, especially generous of spirit, and that, I think you will agree, is the best kind of generosity! This has been a week filled with all the little steps of preparation that go into working with fiber, a week of getting my fiber ducks in a row. I'm doing some mini batts, like those above which I made for my spinning friends. I hope they like the colors, my eye likes to see a lot of color, as you can tell. 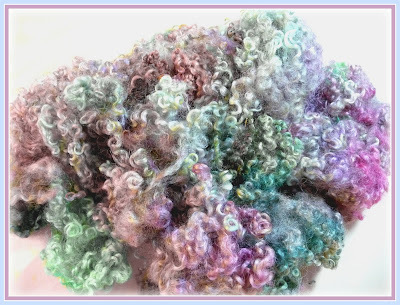 Next, I dyed up some Wenslydale locks in my Vintage Velvet Flowers Palette, I want to hog them all for myself!!! 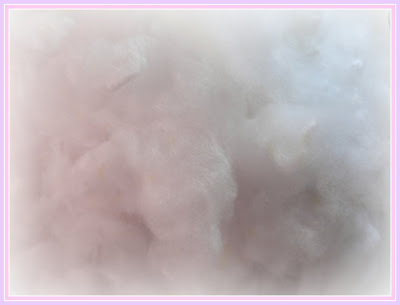 Ahhh, heavenly clouds of fluffy clean white alpaca, I could just dive in! I added the finishing touches to my PixieDust fingerless gloves by crocheting a picot edge in the pink angora I dyed up just for this project, they make my hands happy! So, that's a peek at my studio doings for the week, a lot of little stepping stones go into completing a project and I have enjoyed every bit of the process.